Please click the link to view the video! Jang Keun Suk: Happy Birthday to Gunsama.. Chinese eels, thanks for “Free Hug” event!!! Fighting!!! http://t.cn/zY1h16a 건사마의 생일을 축하하며.. 중국장어들아 프리허그 캠페인 고마워!!!! 짜요!!! Springsuk_USA Note: To support Team H, Chinese eels in Guangzhou and Shanghai went on streets to give “Free Hug” as Jang Keun Suk did in Osaka. Today I’ll shoot those who enjoy our party so much with my water gun!!!!!!! Before I shared her works. This seems her latest one, Team H version. Finally we were invited ASOBINITE!!!!!! It was held at ageHa where Team H got drunk every time!!!!!! It was held at ageHa where is the biggest club spot in Asia!!!!!! Before we perform, I drank a bottle in advance to feel high……..
That made me feel much higher. After all, I took off my shirt again……………. Anyway, our debut was successful!!!!! We’ve had fun meeting you, Nakata-san and Koshijima-san. Cuz we r Team H!! tenshi_akuma’s note: Nakata-san is Yasutaka Nakata, who himself is a Japanese artist as ‘capsule’ with Toshiko Koshijima and producer well-known for Perfume and Kyary Pamyu Pamyu. Team H Japan Tour photo book “[I just wanna have fun] TEAM H PARTY COLLECTORS FANBOOK” will be released in Japan. As the special favor, original heart-shaped ball will be provided. This is the same one used during Team H party. The reality of Team H.
Jang Keun Suk: Even Asia Prince’s greeting is so nice. Finally the mask was unveiled!!! tenshi_akuma’s note: There is a famous spot (bridge) which has a nickname “bridge for picking up girls” in Namba. JKS was holding a placard there for “Free Hug”. And the word “picking up girls” in Japanese sounds similar to Namba. It’s Nampa. Lol. Even though it was cold in Osaka, Jang Keun Suk unexpectedly started to promote Team H in Osaka, wearing the disguise of a mandrill. 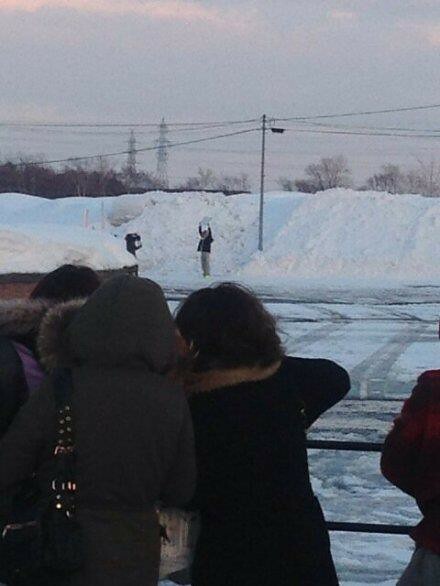 He held a placard “Free Hug by Team H” and hugged passersby. And he gave Team H new album “I just wanna have fun” with his autograph. People were so touched by his sincerity and uniqueness. This “Free Hug” promotional project must be very successful! 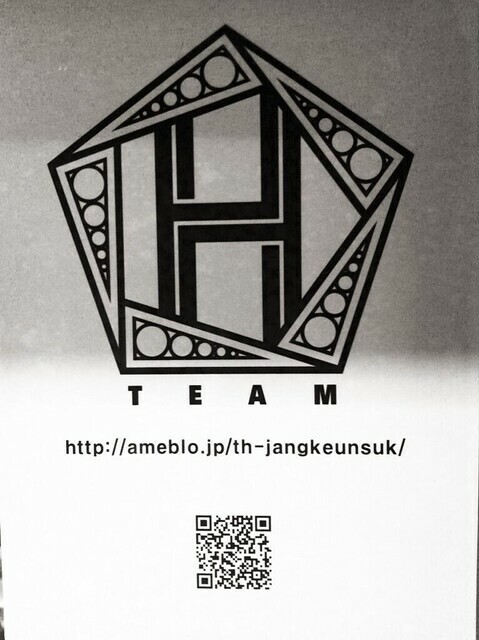 Here’s the related Team H/ JKS Ameblo. Happy Monday morning begins with soaking in a hot spring!!!! 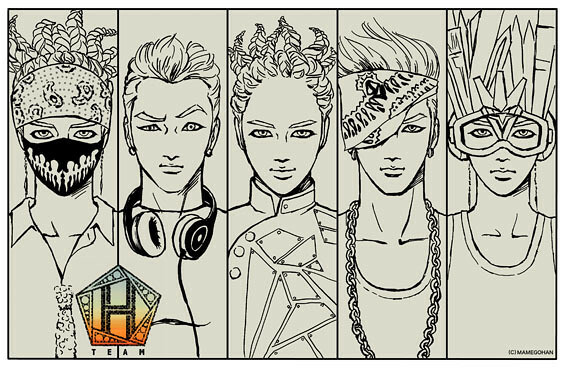 Cuz we r Team H!!! Note: The first one is very funny Team H “What Is Your Name” Eels Parody Version made by Russian Eels. You will have a great laugh and light up your day from it. Enjoy!!! The video is not allowed to be embedded, so please click the link to watch it.